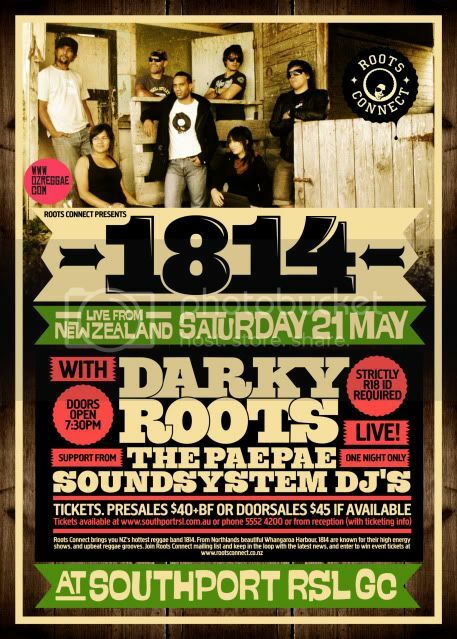 1814 live at Southport RSL with support from Darky Roots and The Paepae Soundsystem (NZ)!!! 1814 return to the GC for one show only, and with their unmistakeable sound and upbeat reggae vibes they never fail to impress. Come an skank to NZs top reggae band as this will be one night not to be missed. And in support are Brissy's finest Darky Roots, along with The Paepae Soundsystem selectors from NZ. This concert is will sell out so get your tickets early! Cheers Hua, it's gonna be a massive show I can't wait to catch Darky Roots live! 1814, Darky Roots and The Paepae Soundsystem is a deadly lineup in the GC. 1814 are killing it in NZ, they're live show is upbeat with loads of energy.